This version originally appeared in the Second Doshu's book Aikido, published in 1974, which was one of the first books on Aikido translated into English. One blow in Aikido is capable of killing an opponent. In practice, obey your instructor, and do not make the practice period a time for needless testing of strength. Aikido is an art in which one learns to face many opponents simultaneously. It therefore requires that you polish and perfect your execution of each movement so that you can take on not only the one directly before you but also those approaching from every direction. Practice at all times with a feeling of pleasurable exhilaration. The teachings of your instructor constitute only a small fraction of what you will learn. Your mastery of each movement will depend almost completely on individual, earnest practice. Daily practice begins with light movements of the body, gradually increasing in intensity and strength; but there must be no over-exertion. That is why even elderly continue to practice with pleasure without bodily harm, and will attain the goal of training. The purpose of Aikido is to train both body and mind and to make one sincere. All Aikido arts are secret in nature and are not to be revealed publicly, nor taught to rogues who will use them for evil purposes. First it is proper to obey the instructor and remember his/her instructions, rising above yourself. No matter how much you may study, if you cling to yourself you will not develop your ability. Secondly, budo is for countering any attack from any direction at any time. When you are ready merely for only one opponent, without being prepared for others, it will be only a common fight. A tight, on-guard posture with an immovable spirit is the basis of every exercise of budo. People generally say, "Man behaves irreproachably," or "An excellent artist is completely on guard." Those who study Aikido should thus spend their daily life thoroughly on guard, even if they are not consciously watching every direction around them. Thirdly, it is fairly painful to keep on earnestly studying. But if you keep up the discipline of budo without tiring, you will at last reach a really enjoyable stage. Some people misunderstand that it is best to suffer while studying, but real study is pleasant at all times. Concentrating ourselves, not having any painful experiences, we are able to enjoy the practice sessions. The fourth rule relates to the assimilation of the techniques. 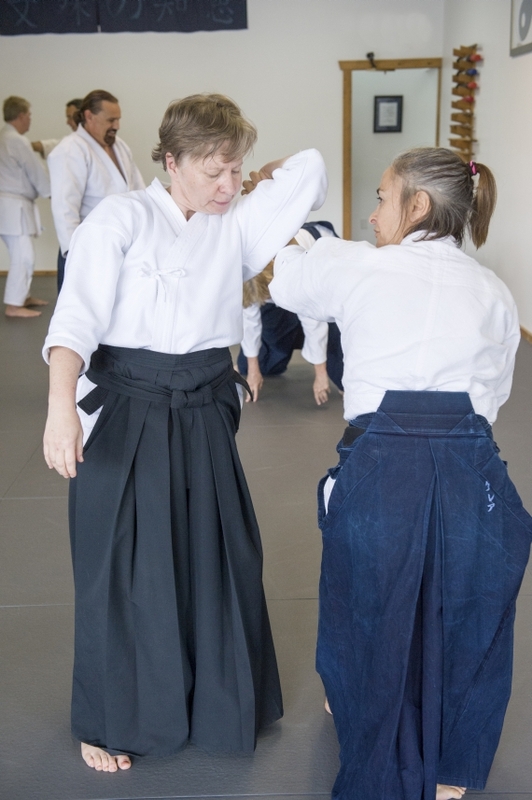 Aikido has a few thousand variations of the techniques. Some students are apt to pursue an accumulation of quantity rather than quality. However when they look back on themselves, they are sorry to learn that they have gained nothing. Soon they lose interest. As innumerable variations of each technique are possible instructors always emphasize the significance of “repetition” to beginners. When you practice each basic technique, over and over again, you master it and then are able to use the variations. When the Master first came to Tokyo, among his earnest students was Admiral Isamu Takeshita. He wrote down all the techniques that he learned under the Master. They amounted to more than two thousand, and yet there were more. He was deadlocked in that he could do none of them well. After careful consideration of several days, he understood the meaning of the Master's caution, “You should study, using the sitting exercise as the base.” He practiced it and then at last became able to manage the techniques: so well that he could acquire the others, which he had not yet been taught by his instructor. For an elderly person of sixty years, it is the same: repetition of the exercise is the secret of improvement, no matter how awkward or unskillful one may be. The fifth rule is not to contradict nature. Excessiveness is to be avoided in anything. Moderation is the key. No matter how little the excess is, the whole posture and the condition of the body are unbalanced. Young lively students are apt to have an idea that they will not be strong unless they force power. This is not true. Natural exercise creates true strength. For this reason, it was possible for Dr. Niki, a man more than eighty years old, to practice Aikido. Lastly, the aim of Aikido is not to merely produce a strong individual, but to create an integrated person. Any educated person knows how brute strength is meaningless in the present day of advanced civilization. For this reason the Master forbade Aikido to be misused and severely cautioned everyone. He would not permit the publication of his art techniques and required introductions and guarantees for each student. In summary, those who wish to study Aikido should have a righteous and fair mind, obey the instructors, and study naturally. As a matter of consequence, the techniques will be cultivated skillfully and a noble character will be created in this atmosphere.